The commercial launch sees Sagem’s Cosy Phone — an NFC handset announced in February this year and aimed at senior citizens and business users — become the first widely available NFC phone to support the Single Wire Protocol. Sagem Wireless has officially launched its NFC-enabled Cosy Phone. The phone was first announced in February and NFC World has been testing out a pre-production unit since September. The Cosy Phone is available in France now “through some operators” as well as selected mobile phone retailers, says Sagem Wireless. It will be available in the UK and Ireland during November and in additional European markets at a later date. The device is compliant with the Single Wire Protocol (SWP), allowing the SIM to be used as the secure element, and meets all current NFC Forum standards. It also supports both the JSR257 Contactless Communications API for tag reading/writing applications and the JSR177 Satsa API for secure communications between the SIM and the baseband processor. Both 2.5G Edge and 3G versions are available. The Cosy Phone has been specifically designed to meet the needs of two target markets that have an overlapping need for simplicity. The first is the over 50s, described by Sagem Wireless’s NFC product line manager Cyril Caillaud as ‘active seniors’. 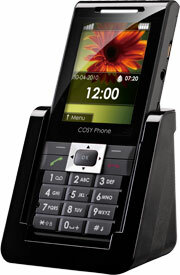 For this group the Cosy Phone provides large keys, large screen fonts and a straightforward user interface. And, as an aid to those whose hearing may no longer be perfect, the phone also vibrates, rather than beeps, to indicate an NFC transaction or operation has been successful and the phone also includes a Hearing Aid Compatibility (HAC) option.